Edinburgh Yarn Festival 2018 was absolutely wonderful (if exhausting!) - thanks so much to everyone who visited my stall and came to say hi. This year for EYF I teamed up with Scottish hand-dyer DyeNinja to create a scarf design which we sold in kits containing pattern + yarn (I have some remaining available here on my website). 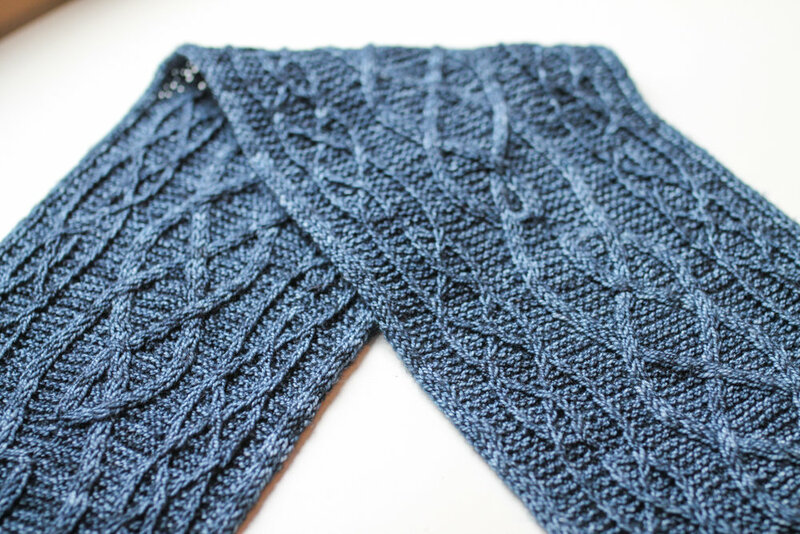 The Bain scarf is pretty special, because it's the first design I've made using what may (or may not!) be a new technique for reversible cables. This is a technique that I've had in development for a pretty long time - I wanted to talk a little bit about where the initial idea came from, and the long process of bringing it into reality. I should begin by saying that, as far as I'm aware, I haven't invented anything radically new here - I think I've just taken existing techniques and put them together in a possibly new way. I think there's an element of double-knitting (the cable columns could be though of as double-knitted tubes - with the background fabric moving through the middle of each tube as the cable travels across it) - however the fabric itself is not double-knitted. The simplest way that I can think of it and describe it is as three layers - the double-knitted cable columns, and the single-knitted background fabric. 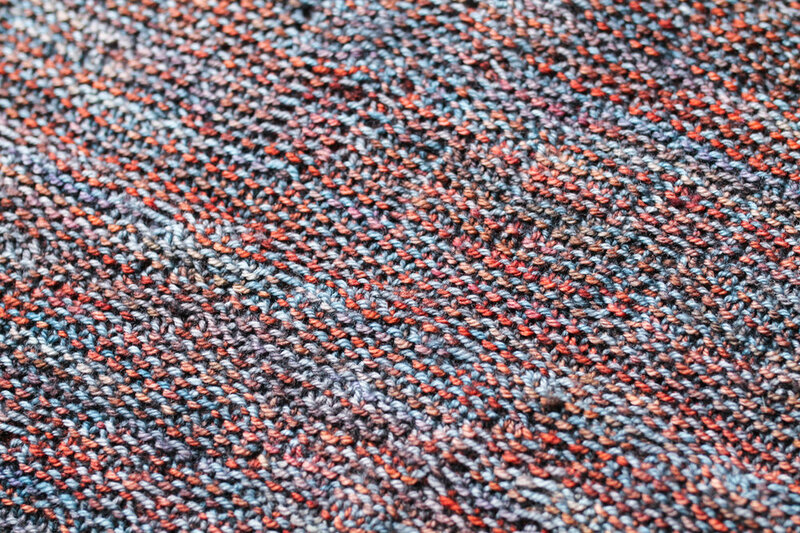 Obviously the background fabric needs to be reversible for the pattern to be totally, truly reversible - I've used garter stitch in this design but any other reversible fabric like seed stitch or rib, for example, would work too. I first had the idea for this technique whilst working on Illuminated Knits. All of the designs in Illuminated Knits make use of slipped-stitch cabling, with alternating single-round stripes; the slipped stitches make the colours in the cable contrast against the striped background (giving the effect of colourwork without having to use stranded knitting or intarsia). 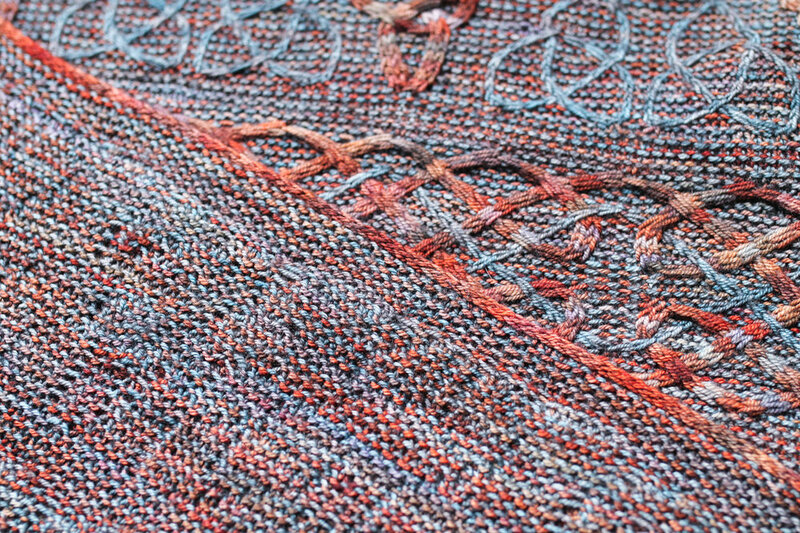 An additional benefit of slipped-stitch fabric is that the wrong-side of the work looks very neat - instead of the floated strands of yarn that you would see in stranded knitting, the wrong-side of slipped-stitch cable fabric simply shows the stripes of the two different colours of yarn, and a very slight impression of a ridge where the cables are travelling across the right-side of the fabric. 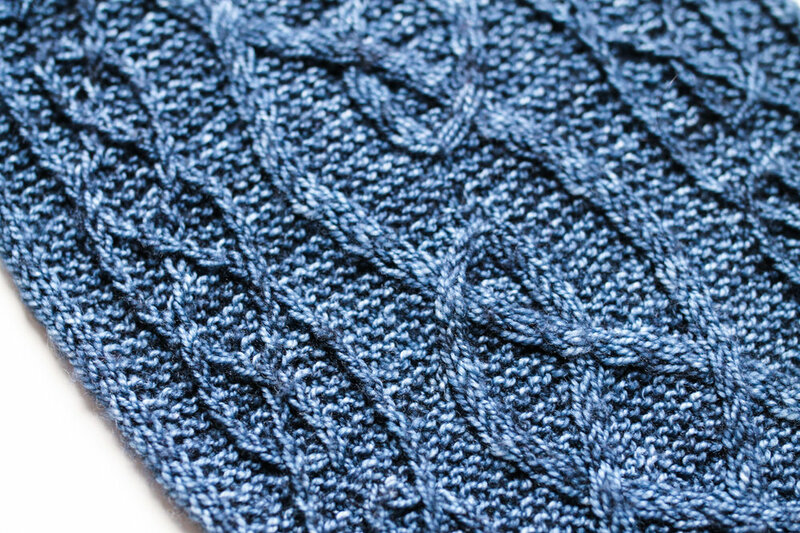 The strands of yarn that run across the backs of the slipped stitches are somewhat visible on the wrong-side, but nowhere near as prominent as you might expect - the structure of the cabled fabric seems to pull together on either side of the cable, so that the strands close up and shorten to some extent. One day, as I was musing over the pleasing neatness of the wrong-side of this type of fabric, I had a light-bulb moment - if I were to place cables on the wrong-side of this fabric, running parallel to the ridges created by the cables on the right-side, the ridges might be hidden and become even more difficult to see, creating a completely reversible fabric. Consider the following diagrams, which illustrate the basic arrangement underpinning this concept. For RS (or Side 1) rows: p4, k2, sl2wyif, p4. For WS (or Side 2) rows: p4, k2, sl2wyif, p4. Side 1 - p4, k2, sl2wyif, p4. Side 2 - p4, k2, sl2wyif, p4. The fabric is reverse garter st, with a column of 4 sts which appears as a 2 stitch wide column on each side (for illustrative purposes, I've highlighted each half of the column as different colours, but hopefully you can see that when knitted all in the same colour yarn, the fabric will look identical on each side). 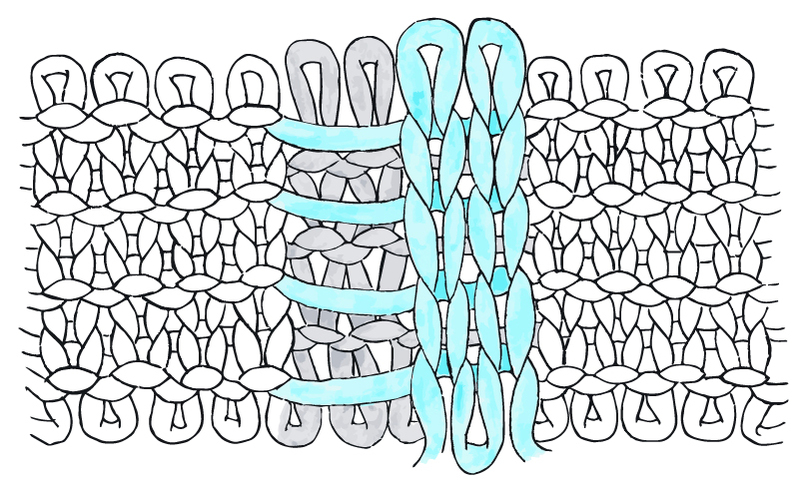 I've exaggerated the length of the strand running in front of the slipped stitches, however as noted before, in practise the cable column draws together and shortens this strand - making it almost completely invisible. As you work, and as the stitches increase in distance from their initial beginning on the needle, the cable columns helpfully shift from being side-by-side (as they are on the needle) to being perfectly in line with each other in the finished work. (Incidentally, once you understand this concept, you should be able to see that this arrangement can be used for cables of other thicknesses too, for example the thinner, twisted stitch cables that run along the sides of Bain - which use columns of 2 sts, that appear as 1 st on each side). New technique? (Or something I've 'unvented', perhaps?!) Totally reversible travelling cables. Fabric is single thickness, cables are double thickness. Has anyone seen this used before? Having the initial light-bulb moment was one thing - working it out into something that I could knit (and, just as importantly, actually describe and chart so that others could knit it too) was another thing entirely! 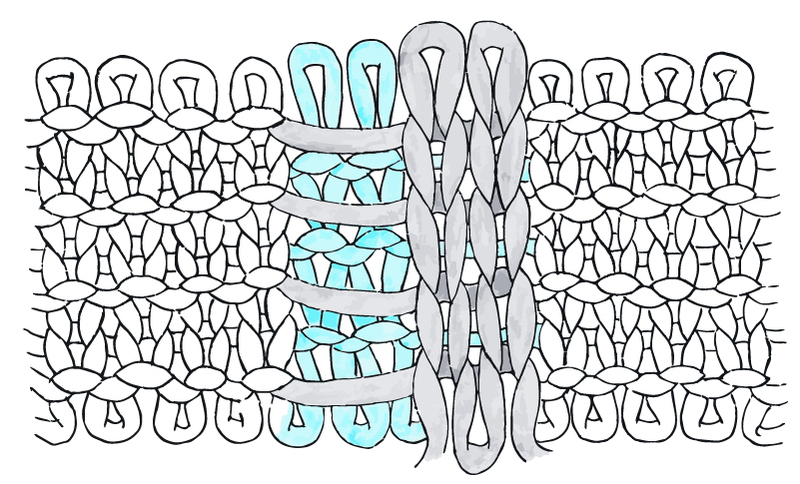 I realised early on that whilst this reversible effect is very easy to achieve with straight columns of stitches (as pictured in the diagram above), the problem of making those stitches travel as cables over a background fabric was much more complex. The crucial thing here is that the background fabric needs to travel in-between the cable columns. The way that I managed to get this to work (after a lot of trial and error!) was to stagger the movement of the cables in such a way that the background fabric is only moving through one section of the double-knitted cable column on each row. On the next row the other half of the cable column moves, and the background fabric has completed its pass through the cable column. This is hard to expain in words but makes sense once knitted - it also has a pleasant symmetry to it, returning the stitches back to their original arrangement in the cable column. I decided to go with a basic 'resting' arrangement of k2, sl2 for each column - this is the configuration that the stitches return to after crossing over the background fabric. It should be noted that there are various configurations that would work - this was just the one that I chose and decided to stick to, for consistency. The one remaining piece of the puzzle that I needed to work out was how to get closed-loop increases and decreases to function within this technique (these are the 1-into-5/5-into-1 stitches that I use heavily in my work, and which allow Celtic-style knotwork to be knitted). This actually ended up being easier than I had anticipated - I had already worked out that certain movements needed to be staggered across consecutive rows, so I tried this with the increases and decreases and found that it worked perfectly, as long as the stitches had already been rearranged into the correct position. Because this technique uses a lot of slipped-stitches, more 'rest' rows need to be built in between the cabling rows, to give the fabric enough vertical height (slipped-stitches pull fabric inwards vertically, so extra rows are required). These rest rows provide the perfect opportunity to manoeuvre stitches into the right position for things like increases/decreases and more complicated cable stitches. Once I understood how the technique could be used, and had proved to myself that it was knittable, the final challenge was to get it into a format that other knitters could understand. The solution I eventually arrived at was to chart both sides of the pattern, and read the chart for each side from right-to-left. So, even though the work is knitted flat, each side is presented separately in the charts (and in the written versions of the charts). This seemed to be the most intuitive was to go about it, as there is no right or wrong side - just 2 different sides which are mirror images of each other. I did initially try to chart the whole thing in one - this actually makes more sense from the perspective of a designer, because I could clearly see how the cables lined up between each side. However, it would have involved showing the cables from only one side, so I would have needed to use different symbols for the second side, and the second side rows would have had to be read from left-to-right. I didn't want it to be too overwhelming for the knitter, so went with the option that seemed to be easier to knit from. It was a relief to send it out to my test-knitters and find that they could follow the charts and understand what was going on! I'm really excited about this technique, and I'm looking forward to using it in further designs. I have a lot of ideas about possible applications. I think, perhaps most intriguingly, this could be used with single-rnd stripes (as I used in Illuminated Knits), to make reversible cables which are different colours on each side. It certainly opens up a lots of possibilities and I can't wait to explore them.